One of the things we noticed right away when my husband and I arrived in Madison, WI, was that the water seems to have quite a bit of calcium in it. Calcium deposits build up on the taps and, when we boil water, on our pots. This happens a lot because we boil our water, then filter it. We boil it because, well, the water in Madison kind of weirds us out due to the buildup. I've read up on it a lot and they say that it's safe to drink, but boiling can't hurt, right? 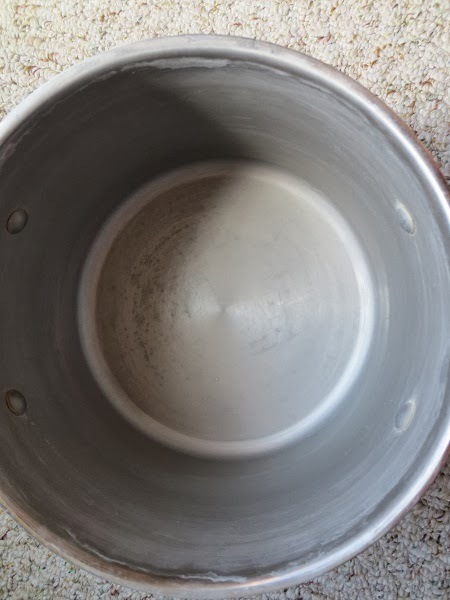 It's not just the buildup that can be a problem, but sometimes when something gets burnt or a little stuck on the pot it can be a real nuisance to scrub off. 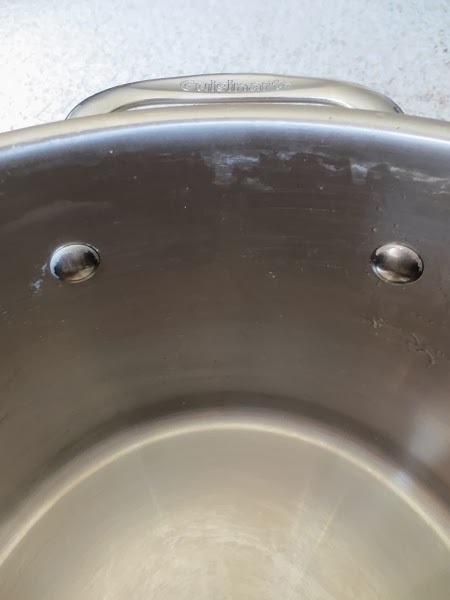 So I use a method that my German Omi used to use for cleaning other things (and one that's similar to the one I use to Naturally Clean a Coffee Pot), and all it requires is something really cheap that most of us regularly in our kitchens. And it's as simple as boiling a pot of water. No SOS pads or frustrating, futile scrubbing required. AND it won't damage your pot. 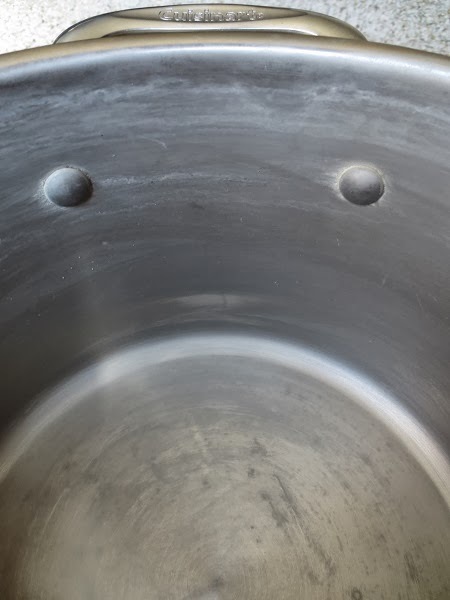 The pot I usually end up cleaning is this Cuisinart Stainless Steel 6-Quart Sauce Pot that came as a bonus pot with the Cuisineart Cookware Set I bought with some of our wedding gift money. I'm quite happy with the whole set, it's eco-friendly with both ceramic and stainless steel pots and pans. That's it. To clean off the mineral buildup, or to get rid of cook on food, I pour about 1/2 cup plain white vinegar into the pot, then add another cup or two of water. Put a tight fitting lid on the pot, bring it to a boil, reduce to simmer for 2 or 3 minutes to let the steam do most of the work for you. The vinegar and water will steam up the sides and help to loosen most of the minerals and gunk. From here, I put on some oven mitts and hold the pot over the kitchen. I swish the vinegar solution around and up the sides a few times, and, for stubborn stains, I use a scrub brush to do a quick swipe (if you use a dish cloth you'll probably burn your hands, so a long handled brush is best). Then rinse and be done! I also like to use vinegar as a cleaner because chemical cleaners have been shown to cause allergic reactions and contribute to higher rates of food allergies. Do you use natural cleaners? If so, what do you use? Your tips helped me a lot. I've never cleaned my pot the natural way. Now I will try and will do it only this way in the future. Thanks for sharing this post. Danielle, what an awesome post! Thank you!! :) I also live with severe allergies and chemical sensitivities that keep me confined to my home most of the time. I also had to change to "scent free and chemical free" products (personal and for cleaning.) I use Vinegar all the time! I also use baking soda, hydrogen peroxide, and olive oil and lemon juice. 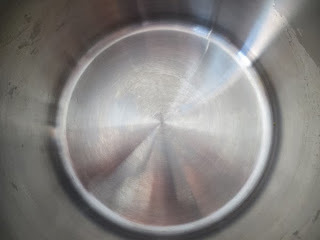 I love your blog and so happy to have found it while searching for a "natural way" to clean stainless steel cookware. You're so welcome! I'm glad you've found it helpful and hope you find some other useful stuff here. I use vinegar and baking soda all the time, too. I can't stand the smell of chemical cleaners, they make me nauseous! Great effort, it looks like you bought a new one ! I'm sorry to hear you've had problems with yours. I've had mine for four years now and they're still good. I followed all the directions that came with them - I take care not to turn the heat up to high and wash them without harsh chemicals. I also stack them with a towel in between so they don't get scratched, or use metal utensils on them.